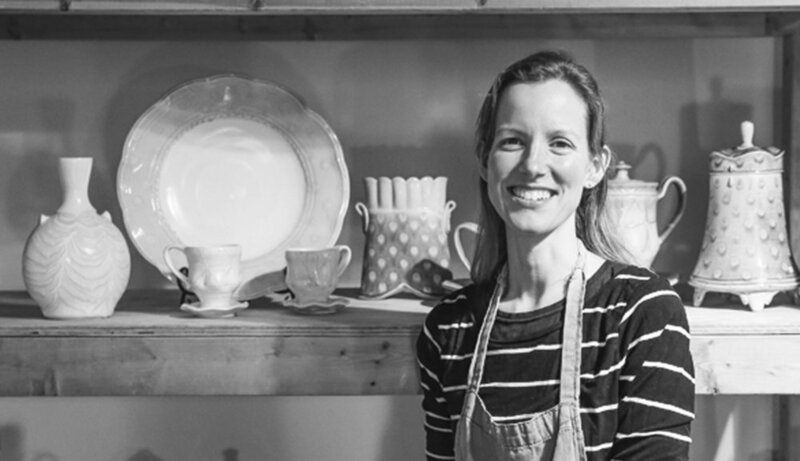 Amelia Stamps is a studio potter living in Lexington, KY who has deep connections to the clay community both in North Carolina as well as here in her chosen home in the Bluegrass state. Amelia Stamps was born in North Carolina to two working clay artists. This early experience of growing up in a household where clay was an integral part of the family left an indelible mark on her life. Her early life growing up in Western North Carolina exposed her the importance of craft and working with your hands. Unlike many of us, her home was filled with handmade pots and this exposure instilled in her the importance of work made for everyday use. Amelia attended the University of North Carolina at Asheville where she received her BFA in Studio Art. Studying at UNCA allowed Amelia to explore multiple firing temperatures and ways of working. After her sophomore year, she spent a year working for a full time production potter. This experience taught her about the flow of working in a production studio. It also provided the template for how to be a working artist. The motivation and drive to persevere, the work ethic to get up each day and work on your craft, and the many jobs that are a requirement of the full time studio artist. Amelia’s work is wheel thrown and decorated with layerings of glazes. This technique of layering glazes and the use of wax resist helps create a body of work that references the decorative tail feathers of a peacock. Her forms are soft and subtle and function both as utilitarian vessels and objects of contemplation. The use of slip trailed dots, lines and patterns add a understated tactile sensation to the surface of her forms. Many of her forms reference the soft malleability of clay as well as alluding to quilting or ruffles on the edge of dress. These elements help to add a level of sensuality to her forms. Currently, Amelia works out of her home studio in Lexington where she lives with her husband and UK ceramics professor, Hunter Stamps and their two daughters. We are looking forward to Amelia’s return to SXPF this year.